Sign Up and Sign In links have been temporarily disabled. The Association for Manufacturing (AME) is pleased to announce TourGuide Solutions as the exclusive AME provider of wireless tour system headsets. What does this mean to you? As a member of AME, you will have access to high quality, portable live-audio tour equipment and get discounted rates for purchase and rental tour guide systems! Move and be heard with a wireless tour system from TourGuide Solutions. Offering lightweight audio guide systems to overcome noise and acoustically challenging environments with crisp, clear sound performance. Recommended systems built for manufacturing: Sennheiser 2020 Tour Guide System with superior sound quality for conducting tours in noisy environments and Williams Sound Digi-wave System for two-way, interactive tours. 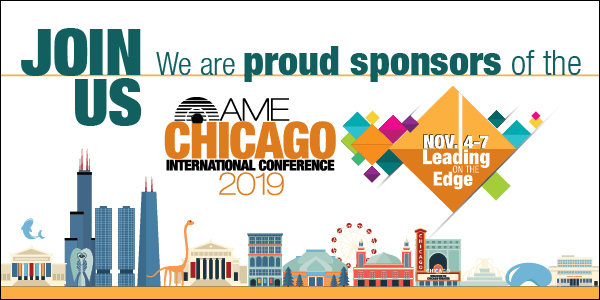 TourGuide Solutions is a proud sponsor of the AME International Conference in Chicago. Stop by to learn more!